For enthusiasts, a car is more than a machine that gets one from point A to point B. The car encompasses the passion and appreciation for the platform. It serves as a blank canvas for the respective owner to tinker with and create something unique. Larry purchased his 1970 Nissan 240Z on his 21st birthday and began modifying as soon as possible. The main purpose behind the build was to create a racecar that can compete. 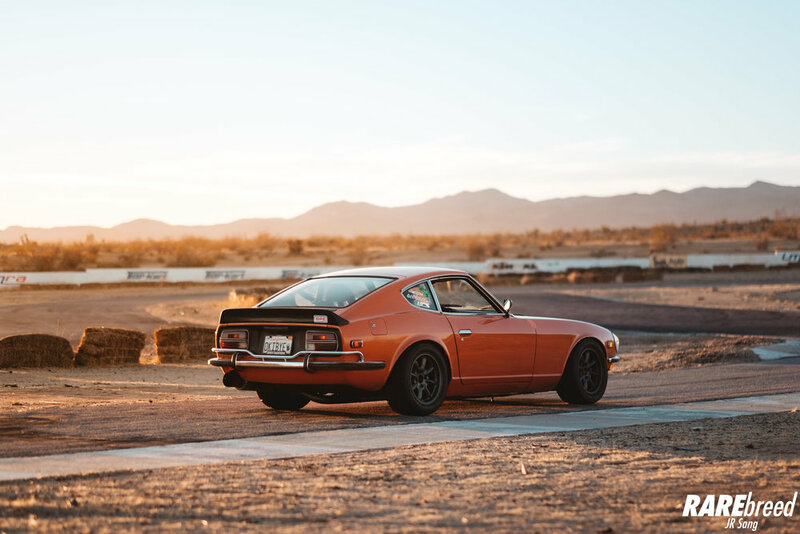 Fast forward to the present day, Larry has taken his autocross roots and is transforming the Z to a daily street car that he can enjoy for years to come. Larry nicknamed the 240Z "Ole Orange Bang". The name comes from the inaugural drive on PCH after he bought the car. During the drive, he heard a loud bang. Turns out that the gas gauge was broken and he ran out of gas- Ole Orange Bang was born. The condition of the 70's era car is impressive. Even more impressive is despite how hard this car is driven, the condition is otherwise perfect besides the rock chips associated with spirited drives. A fun fact about Larry's Z is that it's is camera car to chase drift cars on the tracks. In order to fully enjoy the canyon drives as well as keep up with drift cars on the track, the 240Z had a SR20DET transplant from a previous Formula Drift car. Pushing 300hp to the wheel and 300 ft-lb of torque, Orange Bang is an absolute monster. Upon first look, this may look like an impressively clean 240Z. However, it is way more than that. Larry says that this can be thought of as a Hybrid Z. He has incorporated parts from other manufacturers such as Porsche 911 axels, a Subaru STI IRS, and Toyota 4X4 truck brakes. Although a Nissan part, the transmission was also swapped with a 5 Speed Transmission from a S13. Although unseen to the untrained eye, these upgrades opened the door to higher performance. The simple yet race car-esque interior perfectly matches the function of the car. Be sure to follow Larry on Instagram! Technology has come a long way. The original lighting from the 70's was too dim to safely maneuver the streets. A set of LED's was installed to the tail lights and a set of HID projectors was placed in the headlights to improve visibility.